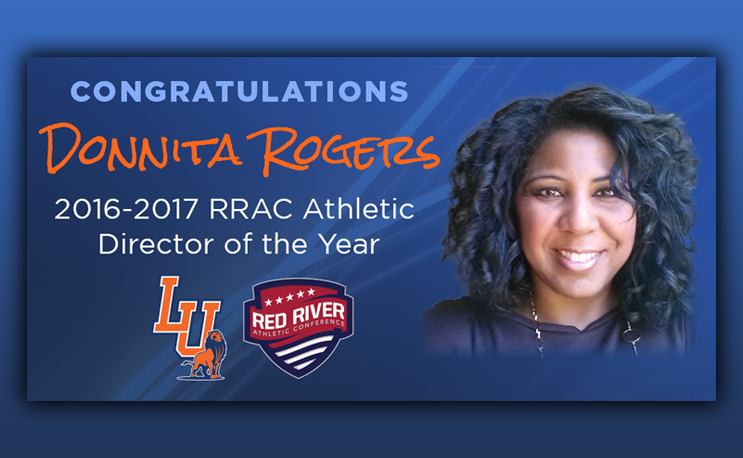 WACO, Texas – Langston University’s (Okla.) Donnita Drain-Rogers has earned the distinction of 2016-17 RRAC Athletic Director of the Year, two years after returning to the school to take the lead role with the Lions’ program. Rogers was the head women’s basketball for Langston from 2000-08 and, since her return in 2015, the department has reached new heights. The RRAC AD of the Year award recognizes the athletic director who had the best year in overall program improvement, facility development, game administration, NAIA Champions of Character commitment, ability to hire and keep quality coaches, program growth in sports and revenue opportunities, contributions at the conference and national levels, and student-athlete development. Rogers was previously recognized as the 2003 NAIA Region VI Athletic Director of the Year while at Northwestern Oklahoma State University. In the last year, she improved Langston’s promotional tools, created a new national event and has overseen a number of program honors such as the Lions first trip to the NAIA Division I Men’s Basketball Championship quarterfinals. Led by Head Coach Stan Holt, the Langston men’s basketball team reached the RRAC Basketball Tournament championship game before climbing to the Elite Eight of the NAIA tournament. The Lions won the RRAC tournament in 2016. Langston’s women’s basketball team also reached the RRAC tournament. In the spring, Langston hosted the first ever National HBCU Softball Classic at ASA Hall of Fame Stadium in Oklahoma City. In addition to the Lions, seven visiting teams competed over two days including Grambling State University (La.) and Southern University (La.). Langston followed that with two upsets in the RRAC Softball Tournament to finish fourth in the event. The Lions placed third in RRAC men’s track & field and fourth in the women’s meet. Langston had five volleyball all-conference selections, four in women’s basketball, five in men’s basketball and two NAIA All-Americans. During the last year, Langston redesigned its athletics website to enhance its coverage and stepped up its efforts to provide news and content through social media.